In preparation for the Dubai International Boat Show 2018, let’s take a look at some of the finest and most luxurious superyachts that will be displayed there which will make you want to sail in one right away. As you sit on a well-laid dining table for your breakfast, your private butler serves you your favourite macchiato while an ensuite chef freshly bakes some goat cheese croissants for you. Holding your coffee, you walk towards the deck to you see how far you’ve sailed on your superyacht. Surrounded in top-most luxury, yet so close to nature that you can feel the water tides, you find yourself sinking in a mood of relaxation with a pinch of thrill. Wasn’t the imagination beautiful? Superyachts help you do exactly that — transform your dreams into an impeccable reality. The Dubai International Boat Show 2018, which is to be held between the 27th of February to the 3rd of March, brings you the fastest and most classic superyachts ever built in the region and beyond. It is a time to explore what’s new in the market and which one deserves to be yours next. The Pemberley has made it easier for you. We’ve shortlisted five of the best superyachts which are a must to see and experience to give you an idea beforehand. One of Al Shaali Marine’s most luxurious offerings is the AS 130 luxury superyacht. The 130ft long yacht is especially designed to cater to every need of yours. 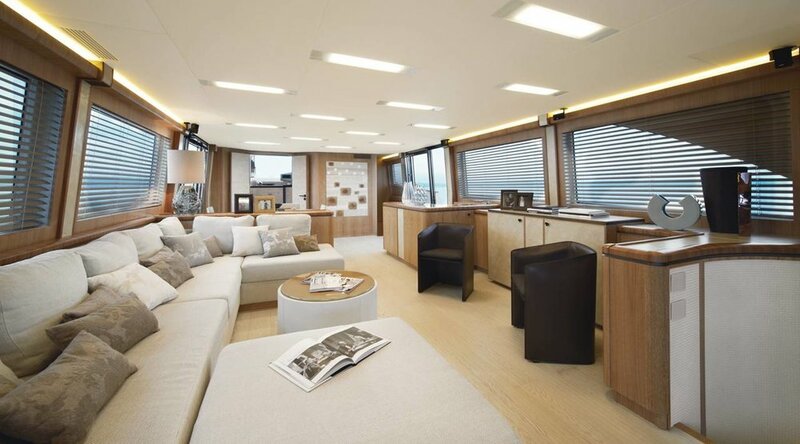 Whether it is a full-fledged bedroom or an LCD television, the yacht has it all. Running at a speed between 24-26 knots, you can sail up to 1500km at a stretch. The fourth and the most advanced yacht in the Silveryacht series, this one raises the standards to an impressive and an unimaginable level. The 77m yacht is the world’s largest and fastest aluminium motor yacht with a maximum speed of 27knots. She can accommodate up to 20 guests and comprises of a suite, lounge, private deck, three VIP guest cabins, one doubt guest cabin and three more twin cabins. Cantered around comfort, this superyacht is unlike any other. It doesn’t have the palatial interiors, customary to usual superyachts, but it expresses a different lifestyle altogether, one that’s private, chic and cosy. While the interiors have been kept human size, the exteriors are exaggerated. While you can easily take a walk hand in hand around the deck, you might want to check out the uniquely designed glass-walled superyacht gym, one that most of its competitors don’t have. This 86ft superyacht from the Monte Carlo Yacht collection, with a maximum speed of 29knots, exhibits a regal personality. 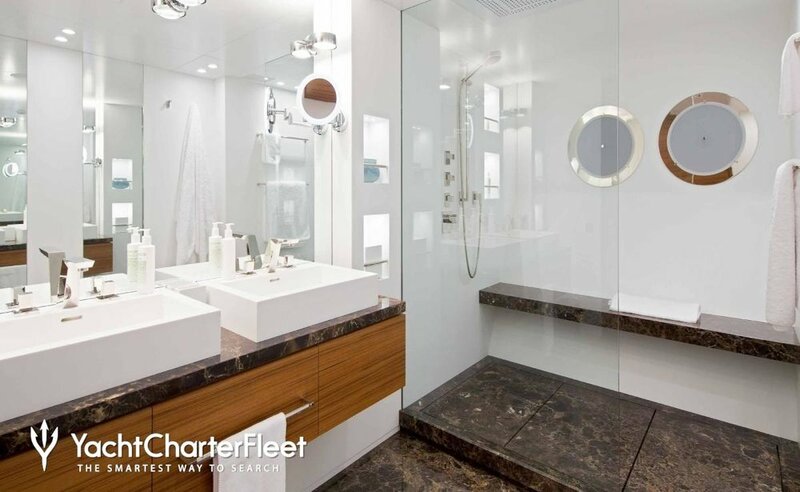 Quite typical of the brand, this yacht too is designed to create larger spaces by having a spacious guest area, stunning interiors and comfort luxury. The roomy surface area is ideal for large sun-loungers, comfy sofas and a table for taking meals even in the shade, enjoying the view of the sea with family and guests in a space that is both open and private. 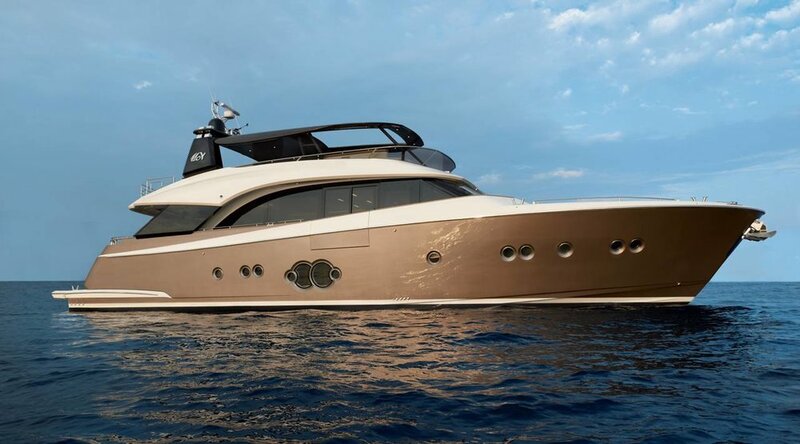 This is one of Riva’s iconic superyachts. 26.7m in length, the made in Italy superyacht has a maximum speed of 38knots, much more than the ones we’ve seen. 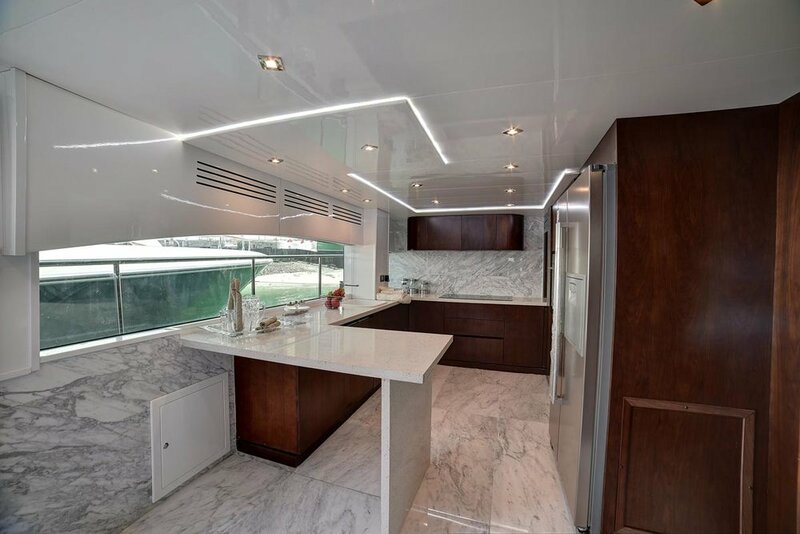 The interiors for this yacht have been designed by Official Italiana Design while the naval architecture has been developed by the renowned Ferretti Engineering Department. Smaller in size, this yacht can accommodate up to eight people with two crew members.